No plans yet for Valentine´s day? Join us for the last day of the hispanic cinema at Cervantes. After the movie there will be some wine and tapas! 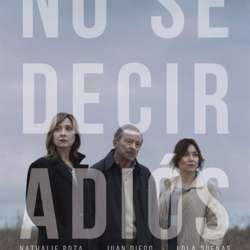 Carla (Nathalie Poza) receives a call from her sister (Lola Dueñas): her father (Juan Diego), who she has not spoken to in a long time, is ill. That same day, Carla takes a flight to Almeria, to the house of her childhood. There, doctors give her father a few months to live. Despite everyone’s opinion and recommendations, she decides to take him to Barcelona to try a second opinion. From that moment, they both embark on a journey to escape a reality they don’t dare to face.